Australian star rugby player Israel Folau. 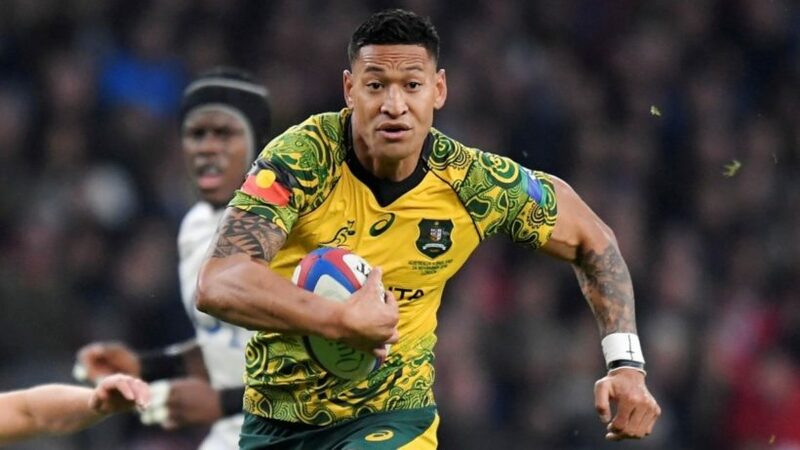 (by Euan McKirdy, CNN) – Australia’s rugby union authorities have issued star player Israel Folau with a code of conduct breach notice over his controversial social media post…. Last week, the Wallabies and New South Wales Waratahs fullback posted an image on Instagram [that said “Warning”] listing “drunks, homosexuals, adulterers, liars, fornicators, thieves, atheists and idolaters,” reading underneath, “Hell awaits you. Repent! Only Jesus Saves” The post has not been removed. In April 2018, Folau — who has won 73 caps and had a contract with Rugby Australia until 2022 — was criticized for writing in an Instagram comment [to a question about what he thought] that gay people would go to hell unless they repented. Folau, who broke the record for Super Rugby tries earlier this month, also tweeted a screenshot of the news that Tasmania last week became the first Australian jurisdiction to make gender “optional” on birth certificates. Published at CNN .com on April 15. Reprinted here for educational purposes only. May not be reproduced on other websites without permission from CNN. “I share it with love. I can see the other side of the coin where people’s reactions are the total opposite to how I’m sharing it. “First and foremost, I live for God now. Whatever He wants me to do, I believe His plans for me are better than whatever I can think. If that’s not to continue on playing, so be it. b) Folau was warned by the rugby union not to post comments disrespectful to anyone. What consequences does he face for disregarding the warning and posting that particular graphic? c) Israel Folau is a superstar rugby player. He risks losing his career if he does not take back his post and apologize. His post was referencing a biblical passage (1 Corinthians 6:9). Read his explanation under “Background” below. What do you think of his decision? Explain your answer. d) Do you think it is wrong for a famous person to express his religious beliefs on social media? (Christians also say the bible says that any person – regardless of how good they are – who does not repent of their sins and put their trust in Jesus Christ will not go to heaven. If they believe this to be true, is it wrong for them to say this to others?) Explain your answer. e) Could the rugby union say they are not responsible for the social media posts of their players, or are they right to put limits on what a player can or cannot post? Explain your answer.